You’ve decided that outsourcing was in the company’s best interest and have hired an offshore team. The contract is signed, the SLA is carefully worked out, the transition period is over – the vendor has started to work. But what happens now? Did you just lose the wheel? How can you manage an outsourcing project? 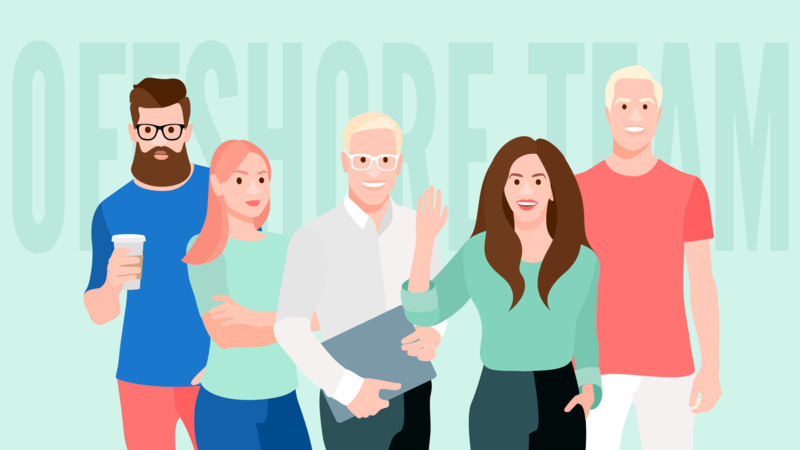 How to sustain the interest of your offshore team in your project? What will keep them passionate about providing you with top-notch service? Firstly, a customer should have a person responsible for the delivery of an idea. Usually, this role is performed by Chief Technical Officer (CTO) or by Chief Executive Officer (CEO) personally. There is an essential pre-requisite for the successful outcome of the outsourcing project – the Customer, before dropping from the clouds onto the offshore outsourcing company, have to know for sure what he wants. It’s not that a customer has to have a super detailed specification or request, but you should at least put your idea in words. Secondly, on the vendor’s side, it’d be better to provide a customer with a tech-savvy and big on economics business analyst (BA). Such an expert will definitely get next to a customer’s idea and be able to deliver it to a development team. As a rule, there is no sweat at this stage of scope and estimation, if the principles are clear, the standards are agreed and the budget is approved, first of all, by a client in and for himself beforehand. Thus the scope, estimate, and management process are not so sophisticated as it seems, indeed all these are fairly simple to maintain. Thirdly, as a rule, on the side of the offshore service provider, a working group is formed and led by a team leader (TL) or a project manager (PM) whose task is to monitor the activities of the team and keep records. Those people conduct regular inspections of compliance with contractual obligations and the level of service and control the introduction of changes, as well. Communicating with the clients, you often hear about the fear that when involving an outsourcer it might be difficult to manage a process that does not belong to you anymore. At first glance, this may really seem so. But who actually drives a cab – a driver or a customer? The customer still has fairly effective tools for managing the relationship with the outsourcer – to impose a fine, to revoke a license and to bring down the contractor’s reputation on the market. And if you look more closely at outsourcing, then there will be found much more tools, than leverages to manage an outsourced team. Anyway, threats and leverages are not the way tech teams are managed, establishing close and firm relationships with your new outsourcing team is crucial to the success of your venture. It is a general practice for companies to outsource specific tasks or projects to save money, so before falling aboard of your new offshore team, remember that affordability is only part of the equation, and to make inroads with the team is de facto, since the quality of an on-time and on-budget output is directly proportional to the satisfaction they have in fulfilling the demands of your business. Treat your in-house team and your offshore team as one. Spend time to get to know the team with whom you will be working. Don’t forget showing your respect, as they are not just a mere vendor you doing business with, but an integral part of your success. Stand up for strong English language skills. And there’s more to learn! To make sure your idea and responsibilities are understood and everyone knows what is an expected output from the start, make sure to establish clear and unhindered communication. English is the global language of business, hence, whether they work on development or data processing, require strong language skills from management in order to grasp all the nuances and to avoid feasible misunderstanding. Make them feel like they’re sitting next to you. Using email and Skype, or such cloud-based corporate messengers as Slack, that is full of cool features (calling and emailing, file sharing, direct messaging, private channels) to sustain smooth communication with a remote team in real time. To get the best out of your team collaborate with them via all these goodies. What’s more, you can hold regular online meetings, as well, in order to increase team productivity by defining goals, sharing ideas and info and reviewing the work done, and developing strategies. Such communication builds common ground between in-house and offshore staff, deploying mutual interests and goals so that everyone understands the global picture of the project. First of all, any outsourcing development company has to provide you with a detailed workflow. Every process here should be absolutely transparent, and based on it you should have an understanding of how the cycle goes from the inception of an idea to the production stage. Next, you need to make sure of efficient development infrastructure. Here, efficiency is understood as a unified system of communication, that embraces such aspects as project management, knowledge background, and a place for correspondence/discussions. Everything should get a foothold in one place, so that you, as a client, can, at any time, seek access to information. You have to live in a world of contractors. So, obviously, you need a tool to help you get stuff done and stay in sync with the team. Productivity tools like JIRA, Asana, ReQtest, Trello, Fossil, Basecamp, etc. are some of the best tools on the market for decent project management. Whatever tool you choose it will reduce friction, improve communication and document project progress. The transparency of an issue tracking system allows both customers and constructors to be held accountable for completing tasks and enable the project to move forward fast due to envisaged agile methodology. Beyond the cards‑on‑a‑board approach that was effective decades ago, there are innovative tool‑based approaches within these soft toolkits that are more appropriate for managing offshore teams. An issue tracking system provides an easy way to document tasks, assign responsible party, and view the status of how the progress is going. Once the system is integrated with your project management environment, all documentation, and communications related to the project become centralized to provide complete transparency into project status. As they say, the person who doesn’t make mistakes is unlikely to do anything. So, don’t get upset if you receive a report on failure, or if something went wrong. Trial and error method is still in the game. But there are situations when mistakes could be eluded if the proper actions were taken but somewhy they weren’t. Still, it is not a reason to throw fire and flames as you actually risk to evoke psychological and emotional burnout of your partner. And what is more important, acting like this is the less-effective way to resolve the problem. Emotions left, just focus on the situation and constructive discussion on how to figure it out in an optimal manner. And true leaders never humiliate other people for their mistakes, they always help them to make a good lesson from that. Provide as much information to the offshore team members as possible. Educate them about your organization, your business and your expectations. If you do not trust the partner, continually worrying about what he is doing, then you lose the focus and the efficiency of your cogitation equals zero. Hire people and companies you trust only. You need to trust that they will work hard and will do what is best for you and your product. It’s undoubtedly important for remote team members to feel their input is valuable and that they are trusted to make decisions based on their professional experience during the implementation. Be liberal of respect and don’t forget to ask for opinions from the offshore resources, that will definitely make them feel engaged into the project and express useful insights that can improve your processes. Encourage them to ask questions and give them irrefragable answers. There is nothing of fun in maintaining documentation, it’s boring and annoying, that is why this is often neglected, considering that the documentation can be fumbled, you can solve everything by talking, but no! Running documentation is a segregate milestone of the whole project that shall be carried out. Stakeholders’ requirements need to be documented in details, plain and clear manner. No ambiguous lines allowed here. You need to describe the business logic, describe the API specification. What’s more, make a rule of joint ownership of documents – say, the API specification for the mobile application was developed by you, but the contractor is entitled to request changes in this documentation. There shouldn’t be an express desire to have all documents in the chokehold. Plus, it is important to have a log of communications between team members and stakeholders, containing issues discussed, conclusions achieved, decisions made. This information can be analyzed after the project to find out if there were better options/solutions for a specific task, and if so, use that knowledge in the future similar project. Soft skills are to be never revoked! Eulogy…this team building technique is pivotal in any daily routine, and certainly within the working process. Praise is an instrument with the help of which you can begin to build a positive contact with workers. Praise is not only emotional release but also an opportunity to get feedback from someone you praise. Take any opportunity to reward the team. Any recognition is a simple, cost-neutral and effective motivation on the way towards your business success. Considering all the above facts we should say that at Redwerk we meet all the values of flexibility, transparency and professional integrity. Our expertise is proved by 13 years of hard work, constant self-analysis and self-criticism in order to achieve self-improvement and recognition of our Clients from all over the world. preserve the transparency of the process and possibility for the Client to control the process. On top of that, we are proud to claim that our team is a reservoir of tech and soft skilled profs, led by experienced team leaders and project managers. To make you a part of a project you will be introduced to the development team so that you feel being on the same side of the fence, ‘cause why not talk to your team directly? Looking for offshore development team?